In case you missed the show during its first season, Mr Robot followed Elliot, a character with more than one duality in his life. During the day he works for a corporation level firm who protects the sensitive data for important business partners, during the night Elliot works as a hacker intent on bring down the very businesses he is paid to protect. Through the course of the first season he moves towards removing all data pertaining to debt, freeing the world, as he sees it, from the yoke of powerful men. The show was very well received and won awards, so there is going to be a second series. 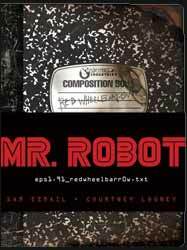 Mr Robot: Red Wheelbarrow: (eps1.91_redwheelbarr0w.txt) is the only official tie in book and is written by Sam Esmail, the creator and show runner and Courtney Looney, a writer on the show. The central conceit of the book is that you are actually reading Elliot’s own notebook, wherein he records his thoughts and continuous battle with his other half. Elliot is torn apart, having two combative personalities in the same body. If you can see the parallels with Fight Club, you’re not alone. However though it may be a child of that film the show was able to carve out its own territory. The first thing you notice is just how much attention to detail is on show. The journal not only feels like a real journal it also contains a number of inserted objects. Now this is no new thing, I’m also looking at another book which pretends to do the same thing, however the devil is in the detail. Included as an insert is an envelope, doesn’t sound exciting, but the object is a real envelope, the torn out page from a book is indiscernible from the real object, the same goes for the newspaper cutting, the pamphlet, the torn journal page with drawn pictures of wheelbarrows, the cigarette packer and the greetings card. All these objects conforms to a real life object, so they are printed on different types of paper and card and even, in the case of the greetings card has a bar code on it. All of these are inserted in the journal and how they did this economically baffles me. I’ve seen this sort of thing done before, but never so convincingly or impressive. Of course the bulk of the book is Elliot’s journal, written in pencil. Rather than retread the story of the first season the book follows a different track. It’s a whole new Elliot adventure into madness by the guys who make the show. So not only does it score high in authenticity; it also sets up some stuff for season two. For fans of the show this is a must buy item, even if you’re not, there is an interesting and coherent story of a man’s own incoherent life with mental illness and the daily battles that Elliot faces. This is an object made with much care and love and it’s hard to find fault, so I won’t.